The quality of the output wave form (230 volt AC) from the inverter determines its efficiency. The quality of the inverter output wave form is expressed using Fourier analysis data to calculate the ‘Total Harmonic Distortion’ (THD). THD is the square root of the sum of the squares of the harmonic voltage divided by the fundamental voltage. Based on the output waveforms, there are three types of Inverters. These are Sine wave, Modified Sine wave and Square wave inverters. Alternating current has continuously varying voltage, which swings from positive to negative. This has an advantage in power transmission over long distance. Power from the Grid is carefully regulated to get a pure sine wave and also the sine wave radiate the least amount of radio power during long distance transmission. But it is expensive to generate sine wave in an inverter. Its quality is excellent and almost all electrical and electronic appliances work well in sine wave inverter. The sine wave is the AC waveform we get from the domestic lines and from the generator. The major advantage of sine wave inverter is that all of the house hold appliances are designed to operate in sine wave AC. Another advantage is that the sine wave is a form of soft temporal rise voltage and it lacks harmonic oscillations which can cause unwanted counter forces on engines, interference on radio equipments and surge current on condensers. Modified sine wave is designed to simulate a sine wave since the generation of sine wave is expensive. This waveform consists of a Flat Plateau of positive voltage, dropping abruptly to zero for a short period, then dropping again to a flat plateau of negative voltage. It then go back to zero again and returning to positive. This short pause at zero volts gives more power to 50 Hz fundamental frequency of AC than the simple square wave. Inverters providing modified sine wave can adequately power most house hold appliances. It is more economical but may present certain problems with appliances like microwave ovens, laser printers, digital clocks and some music systems. 99% of appliances run happily in modified sine wave. Instruments using SCR (Silicon Controlled Rectifier) in the power supply section behave badly with modified sine wave. The SCR will consider the sharp corners of the sine wave as trashes and shut off the instrument. Many of the Laser printers behave like this and fail to work in inverters and UPS providing modified sine wave power. Most variable speed fans buzz when used in modified sine wave inverters. This is the simplest form of output wave available in the cheapest form of inverters. They can run simple appliances without problems but not much Square wave voltage can be easily generated using a simple oscillator. With the help of a transformer, the generated square wave voltage can be transformed into a value of 230 volt AC or higher. Watt is the measure of how much power a device uses when turned on or can supply. If a device uses 100 watts, it is simply the voltage times the ampere (rate of current).If the device takes 10 Amps at 12 Volt DC, it uses 120 watts power. That is 10A x 12 V = 120 W.
A watt hour (or Kilo Watt hour – kWh) is simply how many watt times, how many hours the device is used. If the device uses 100 watts for 10 hours, it is 1000 watt hour or 1 kWh. The electricity tariff is based on kWh. It is the measure of electrical current at the moment. Amps are important to determine the wire size for connecting the inverter to the battery. Low gauge wire will heat up and burn if heavy current flows through it from the battery. Amp-Hour usually abbreviated as Ah is the Amps x Time. Ah is the measure of battery capacity which determines the backup time of the inverter. It represents the maximum load capacity of the inverter. Commonly available inverters are 500 A, 800 VA, 1000 VA, 1500 VA etc. An inverter needs Peak or Surge power and Typical or Average (Usual) power. Peak power is the maximum power that an inverter can supply usually for short time.Some heavy current appliances like motor and refrigerator requires a startup peak power than they require when running. Typical power is the power that the inverter gives on a steady basis. This is usually much lower than the peak power. Typical power is useful in estimating the battery capacity. Therefore inverters must be’ sized’ for the maximum peak load and typical continuous power. Inverters are available in different ‘Size ratings’ from 50 VA up to 50000 VA. Inverters larger than 11000 VA are seldom used in household applications. The first thing you have to consider about the inverter system is its maximum peak power or surge power and steady current supply. The surge rating is usually specified at so many watts for so many seconds. This means that the inverter will handle an over load of that many watts for a short time. This ‘surge capacity’ will vary considerably between inverters and even with in the same brand. Generally 3-15 seconds surge rating is enough to cover 99% of appliances. Inverters with lowest surge rating are the high speed electronic switching types. I = W / V Where I is the current in amps, W is the wattage of the appliance and V the 12volt (battery voltage). W = V X I Where V is the 230 volt AC and I is the current consumption. Watt rating is usually printed on the back side of the appliance near the power cord entry point. VA = W x Inverter loss. Inverter loss is typical around 1.15. If the total load connected to the inverter is 400 watts then the minimum inverter size should be 400 x 1.15. That is 460 VA. A 500 VA is suitable for the load. The capacity of the battery is represented in Ah. It is the amount of current a battery can give during one hour of charge / discharge cycle. High capacity batteries (100 Ah, 150 Ah) are used to power inverters to get sufficient backup time. The formula to select the battery power (Ah) is Load in watts / Voltage of battery x Backup hour. For example if you wants to run 400 watts load on 12 volt battery for 3 hours, then the capacity of the battery should be minimum 100 Ah. Ah = 400 / 12 x 3 = 100 Ah. If the load increases (within the capacity of the inverter), backup time reduces. Before selecting the inverter, it important to calculate the total power consumption of the appliances that are going to be connected to the inverter. It is important to note that the power consumption (Current drain) increases when the driving voltage decreases. When the input voltage drops in the domestic supply lines from 230 V AC to 200 VAC, electric devices will consume more current. For example a load rated 300 Watts (like Fridge) operating in 230 volts uses 1.4 Amps in one hour. The same load takes 1.5 Amps if the line voltage drops to 200 volt during peak hours (6pm- 9 pm). So it is advisable to switch off high current devices during peak hours. This conserves energy as well as reduces the electricity bill. If heavy loads are running in inverter, battery voltage diminishes from 13.5 volts to 12 volts with in a short time. This reduces the backup time. So it is better to connect only light loads such as fan, lights and TV to inverter lines. 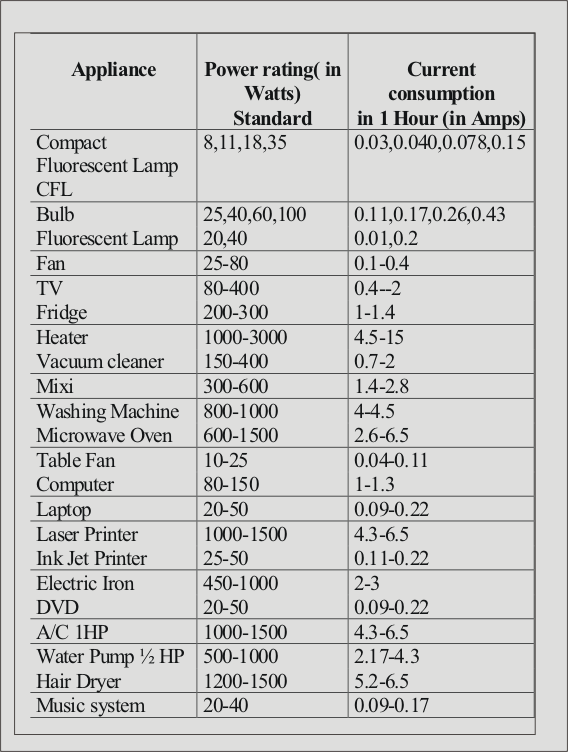 The table given below shows the power rating of common home appliances. Before purchasing an Inverter, it is necessary to calculate the power requirements of the loads that are going to be connected. 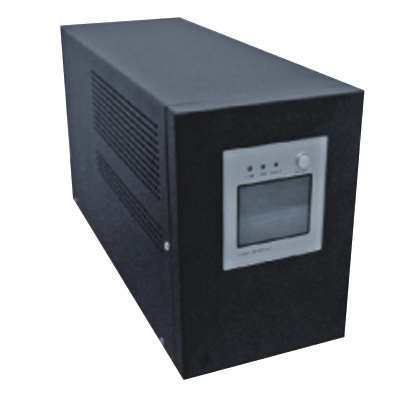 Mid size inverter (500VA to 800 VA) will handle most of the low power household appliances. If you wish to use 2 Fans, 2 Tube lights and 1 TV, the total power consumption will be around 380 Watts. Power loss in the inverter is estimated as 1.15. So the Inverter capacity should be at least 380×1.15. That is 437 VA. The suitable available size is 500 VA. Inverter rating is usually given in VA (Volt Ampere). The backup time of the inverter depends on the type and capacity of the battery used. Battery capacity is represented in Ah (Ampere hour). To power the whole house (say 3000 watts), more planning is necessary. A 5 KVA inverter is necessary in this case. But obviously not every appliance will be ‘ON’ at the same time. So a high capacity inverter is a good choice because, if the load increases above the rated capacity of the inverter, it can lead to hazardous results. If a 24 Volt inverter with 24 volt battery is used, backup time can be doubled. But the cost of the inverter and battery will be high compared to a 12 volt inverter and 12 volt battery. Power loss in Inverter and Current consumption during charging. No inverter can function efficiently. The working of the inverter depends on many factors like conducted load, battery efficiency and maintenance. During operation, inverter will heat up and the transformer will dissipate heat. So some energy will be lost which reduces the efficiency. Proper charging of the battery and its efficiency to hold charge are two very important aspects. Input voltage from the AC lines should be close to 230 volts for proper charging of the battery. Fully charged battery will show 13.8 volts. Inverter should switch on charging immediately when the battery voltage reduces to 12 volts. Charging current depends on the time taken to complete the charging process and also the ‘charge condition’ of the battery. If the battery is discharged to 80% of its efficiency, it will take 5 to 7 Ampere current for charging during the first few hours. Then the current reduces to 500 milli amperes or less. A fully charged battery will not take any current. Most inverters have two mode charging-Boosts charging and Trickle charging. During boost charging, around 5 to 7 ampere current will utilized and during trickle charging only 25 to 50 milli ampere current will be utilized. Previous Disc Capacitor.How to identify? brilliant! You’ve written a very precised description about power inverters, or let’s just call it home inverters. I like how you pin-pointed each facts. Thanks!